Situated in the heart of Barcelona, the luxurious Indigo Barcelona - Plaza Catalunya is only a four-minute walk to the famous Plaça Catalunya. This four-star hotel boasts an outdoor swimming pool with a lovely poolside terrace. All rooms are stylish and air-conditioned. Each is equipped with a flat-screen TV with satellite channels, a private bathroom, and an extensive pillow menu. Furthermore, some rooms have a terrace with lovely views. Complimentary Wi-Fi access is available in all areas of the hotel. Moreover, guests may also avail of the tickets and tour assistance from the 24-hour reception. The DOQ Barcelona offers innovative Spanish cuisine. DOQ Restaurant & Cocktail Bar serves a wide range of quirky drinks and light snacks in a refreshing setting. Indigo Barcelona - Plaza Catalunya is just a three-minute walk from the Passeig de Gràcia Boulevard. La Padrera and Casa Batlló can be reached through a ten-minute walk. 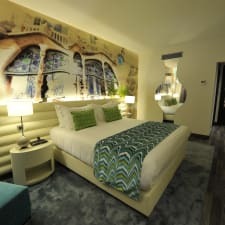 This accommodation is also known as Barcelona Plaza Catalunya, Catalunya, Catalunya Barcelona Plaza, and Hotel Indigo Barcelona Plaza Catalunya. Indigo Barcelona - Plaza Catalunya is centrally located, making practically everything in the city easily accessible. There are also many public transportation options just outside the hotel. Moreover, the area where the hotel is located is full of 24-hour shopping centres and convenient stores, making everything that you may want and need within easy reach. The beds in the hotel are not too soft, while at the same time, not too stiff as well. This allows guests to have a comfortable sleep during their stay. Moreover, the extensive pillow menu even adds up to the convenience and cosiness that each guest gets. Professional staff makes stay convenient. The staffs are efficient in meeting the needs of their valued guests. They are always willing to welcome the guests with the warmest of smiles, and willing to go the extra mile to deliver a high quality of service. The rooms in the hotel are a bit on the small side. However, the hotel management ensures that each furniture and fixture is arranged in such a way that the little free space left is maximised. Guests could still comfortably move around, and everything in the room is still well maintained. Prices are a bit high for some guests. The rated could be a bit high, especially for those who are trying to save as much as they can. However, with the hotel’s standard of service, the price is just right. Internet connection can be slow at times. Free Wi-Fi access is provided for every guest. However, the Internet connection isn’t very reliable as it is both slow and unstable. This makes it inconvenient, especially for those who have their respective business to check online.